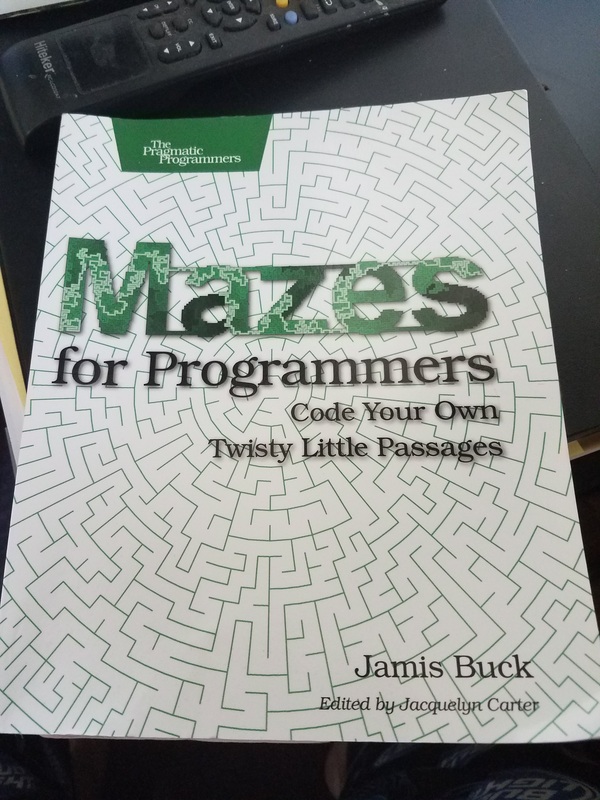 A few weeks back, I picked up a copy of James Buck's Mazes for Programmers: Code Your Own Twisty Little Passages. (The title is, of course, an homage to one of the original text adventure games, Colossal Cave Adventure, or Adventure for short, which featured a maze puzzle where every room was described as "You are in a maze of twisty little passages, all alike"). I read through most of it on my veranda in the mornings, looking out over Long Bay in Antigua while I was on vacation, wishing I had brought my laptop along with me (although my girlfriend is probably happy I did not...). Once I got back, I started diving into implementing some of the ideas from the book - it's been quite a joy, and a much needed break from debugging UCWA applications at the day job. The code in the book is implemented in Ruby, however, I'm not a Rubyist, so I decided that I'd work through the examples in my language of choice, C#. The code is pretty simple, so porting it over has been pretty straight-forward. I also figured it would be an interesting exercise for trying out some of the newer features in the more recent versions of C# - I've been stuck using C# 5.0 due to some tooling that we haven't had a chance to upgrade yet at work. Today, I'm going to mostly cover the examples from Chapter 2, which lays out the general plumbing of the framework that the rest of the book builds on, and implements two simple maze-building algorithms, the Binary Tree and Sidewinder algorithms. For the full code, you can check out my GitHub repository; things there may change slightly from the version presented here as I work through more of the book, but the general structure should remain similar. The easiest way to model a maze is as a 2D rectangular grid of cells. The XY position of the cell in the maze. The cells which neighbor this cell (north, south, east and west). The cells which are linked to this cell. Cells are linked if there is a path between them. For simplicity, we'll only record the cells which are linked to this cell, otherwise assuming that any other cells are not linked. You can ignore the [CanBeNull] annotations if you like - these are just some hints for the ReSharper static analyzer. We'll also define some utility functions which will serve to link and unlink cells, and to test whether two cells are linked. Our linking functions will also handle making sure that links are bidirectional, although with the option of making one-way links. For now, we're not going to make much use of this, but one can imagine that if we extend our map to include one-way connections, like chutes between levels, that will come in handy. The 2D array of Cells - here we will use a nested List<T> for convenience. Accessors that will allow us to index a Cell by its XY coordinates, a random Cell accessor, and iterators that will allow us to access Cells by row or one-by-one. Helper functions to initialize the grid, and setup the neighbors for each cell. 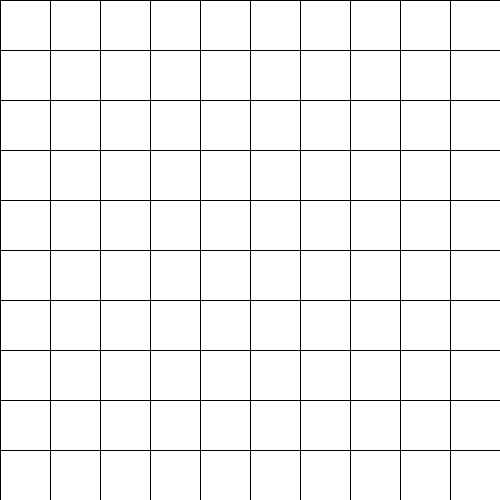 At this point, we can setup and represent a grid for a maze, but we really need a way to output this grid in a way that makes it easy to visualize. As a first step, we'll override the .NET ToString() method to render the grid in ASCII, which is helpful for outputting to the console with small mazes. This is pretty basic - we could fancy things up by using some Unicode or extended ASCII block characters, but it's good enough for debugging purposes. 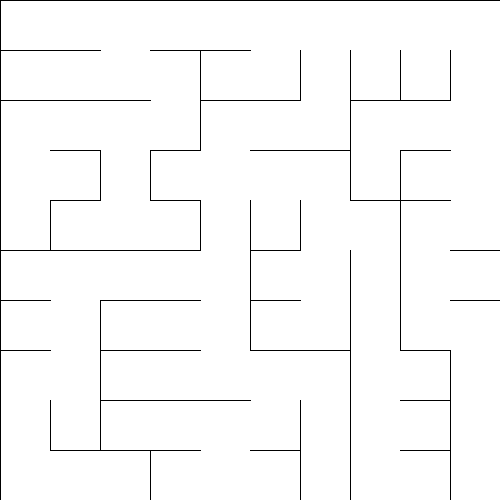 What would be more interesting is rendering the maze as an image, which we will do next, using some simple WinForms graphics commands. 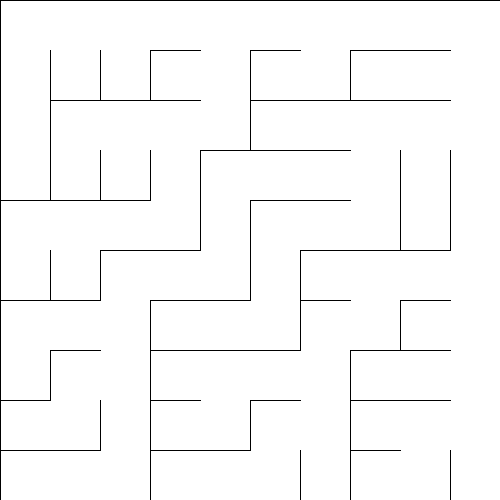 With those foundations out of the way, we can start implementing some algorithms to actually create mazes on our Grid. We're going to start with two very simple algorithms, the Binary Tree and Sidewinder algorithms. These algorithms are very fast and simple to implement, and require very minimal state - although they do have some disadvantages, as we will see. NOTE: If you examine the code on GitHub, these algorithm classes are somewhat more complicated than shown here - they include some additional logic that makes it possible to run the algorithms one step at a time, which is handy for visualizing how the algorithms work. Take the neighboring cells to the north and east, ignoring null cells (i.e., on the top row of the grid, northern neighbors don't exist, and likewise for the eastern neighbors on the right-hand edge of the grid). Pick one of the available options randomly. If there are no options, move on to the next cell. Link the current cell to the chosen neighbor. Move on to the next cell. Here you can see the Binary Tree algorithm proceeding step-by-step. There's a couple things to note about this algorithm. It only needs to visit each cell in the grid once - thus it is O(n) with respect to the number of cells in the grid. It also doesn't need to maintain any state or allocate any additional memory. There's a strong diagonal bias to the paths running from the northeast corner towards the southwest corner or vice versa. This is a consequence of the way the neighboring cells to link were chosen. In fact, if we consider the northeast corner and work towards through the connections, we will form a binary search tree (hence the name), with the northeast corner as the root, and the southwest corner as the deepest leaf. Similarly, it is impossible to move north or west into a dead end. The northernmost row and easternmost column of the grid will always be open. All in all, these biases make the Binary Tree rather predictable, but it is fast and easy on memory. If we are in the northernmost row, connect this cell with it's eastern neighbor. Otherwise, add this cell to the run of cells that we have processed in this row so far. Chose between connecting this cell with its eastern neighbor, or connecting one of the cells in the run of previous cells to its northern neighbor. If we connect northward, clear the run of previously processed cells. Move on to the next cell in the row. Move on to the next row. This is easier to see than to describe in words, but roughly what we are doing is, instead of choosing to go north or east at every cell, we chose between going east, or going north from somewhere in a block of east-west connected cells. This still means that we are processing each cell once, and are thus O(n). We are using a bit of additional memory to store the run of previous cells in the row. All in all, this is still a very fast algorithm. It is now possible to move west into a dead end. However, it is still impossible to hit a dead end going north. While the eastern column is no longer open, the northern row is still an open corridor. Instead of a diagonal northeast-southwest bias, we have a somewhat more subtle north-south bias. From any point, there will only be one northern connection that you can reach. To close, here are the results of the two maze generation algorithms, with Binary Tree on the left and Sidewinder on the right, for comparison's sake. Included in the project on GitHub is a small WinForms app that allows stepping through the algorithms step-by-step, changing the random seed, and saving the mazes out to an image - feel free to play around with it. This has been fun; I'm hoping I'll have time this week to move a little further and write up another post on the next chapter or two and get into implementing Dijkstra's algorithm, as well as some of the more advanced maze generation algorithms.